Summary: The STI-V34150 wireless driveway alarm system has a mediocre solar powered motion sensor and a couple of useful features. But the Dakota 2500 is a better alternative due to its higher quality motion sensor. The STI-V34150 wireless driveway alarm features a solar powered magnetometer sensor that will only detect vehicles. 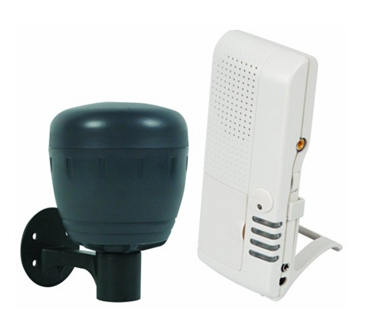 The alarm systems come with 1 receiver, 1 sensor and mounting hardware. The sensor will detect any moving vehicles and it will send a signal to the receiver. You will be notified of the movement by a chime or a voice recording. Since the motion sensor is solar powered, make sure to mount it in partial of full sunlight. The STI-V34150 wireless driveway alarm comes with a decent motion sensor that is powered by solar energy. It has Adjustable sensitivity control and several chimes you can choose from. However, I believe the Dakota 2500 is a superior product since it has one of the best motion sensors on the market.